The Best Collar I've Ever Had! This collar is simply amazing! I wear it every single day and it is comfortable, high quality, and oh so cute! I give it 5 stars! I purchased this collar for use as an every day collar, as I am a 24/7 submissive, and I could not be happier! It is comfortable, easy on the eyes, and the quality is amazing! My favorite qualities about this collar in particular are the colors and the locking buckle. 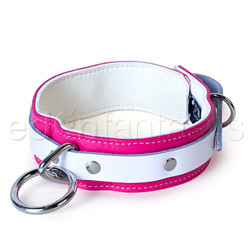 First, let's get the details out of the way: it is made up of a pink vegan leather based strip with a white vegan leather band centered on top of the pink band. There are 7 metal rivets holding the top strip in place. It buckles in the back with a locking buckle and 6 buckle holes. It will fit necks from 12" to 17" comfortably. The front features a triangular ring with a large o-ring that can be used to accommodate a leash or can be used to connect the collar to other devices such as cuffs. The inside is white vegan leather and it is slightly padded for comfort. When it first arrived, it was very simply packaged in a clear plastic bag, with only a tag attached to the buckle of the collar. The tag indicates that this collar has a lifetime warranty, meaning that if it were to break under normal use, Aslan leather will replace it free of charge, which is one of the things I've come to love about Aslan. The tag also gives care instructions and some tips to keep your collar looking nice, such as covering the rivets in clear nail polish to keep them shiny or using a leather polish if the sides start to fray. I Absolutely love, love, LOVE my collar. The pink and white colors complement each other very nicely and I feel that it can be worn in public without being too obvious, but your opinion may vary. It is extremely comfortable to wear, which is a very important thing I look for, since my collar is never to leave my neck unless I am showering (this collar should not get wet; if need be, it can be wiped down with a damp cloth, but make sure to dry it completely as not to damage it). Honestly, a lot of the time, I even forget I'm wearing it! The locking buckle has a small circle at the end of piece that goes through the holes, which allows it to be locked in place. The lock is not included, but you can pick up a small masterlock at any drugstore or hardware store (I use the small pink special edition breast cancer awareness masterlock for mine, since it matches). When it is locked, I find it to be very secure. If i wanted to, there would be no way I could get this off without cutting the leather. Overall, I am extremely happy with this collar and it will be getting much use, seeing as I wear it every day. How do you feel about coloured collars? Does ASLAN Leather Make a Pink Leash to Match its Pink Candy Jaguar Line? Thank you for viewing Pink candy jaguar collar review page!